A visiting Tamil Nadu parliamentary delegation today called for the release of the displaced people in camps in Vavuniya, the restoration of democracy and a political solution to the conflict. 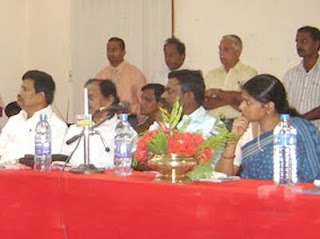 In an address made at the Jaffna library this morning head of the visiting delegation T.R.Balu said a political solution is necessary to resolve the conflict which had lasted for more than 25 years.He added that the Sri Lankan and Indian Tamils had a strong bond, a relationship which is also reflected in the ties between India and Sri Lanka. Also speaking here Kanimozhi, daughter of Tamil Nadu Chief Minister M. Karunanidhi, said that the Tamil people should not shed tears anymore, the displaced people should be reunited with their families and democracy restored in the country.During the visit to Jaffna the Tamil Nadu delegation had talks with Social service Minister Douglas Devananda and the Northern Province Governor Major General Chandrasiri. They also garlanded the statue of the late Chelvanayagam.